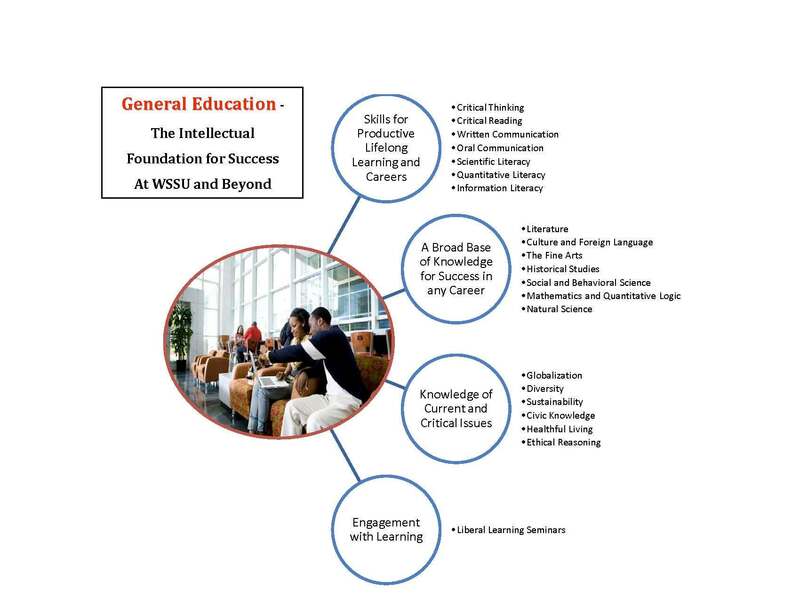 General Education at Winston Salem State University provides the intellectual foundation for both the completion of a major program of study and learning beyond college by affording students a broad based education rooted in the Arts, Humanities and Sciences. The General Education curriculum is designed to foster the development of critical skills such as thinking, writing, and speaking; while offering students the opportunity to explore the vast fields that make up the academy. Students are required to take a minimum of 60 semester hours outside of their major field of study. There is no single path towards fulfilling this requirement. The student is free to choose at least 20 courses that are sampled widely from the curricular offerings. There are however, some minimum expectations about these choices. The student must take at least one course from each of Seven Areas of Knowledge which include Literature, History, Social/Behavioral Science, Natural Science, Mathematics and Quantitative Logic, Fine Arts, and Foreign Language and Culture. Courses focusing on the Seven Learning Outcomes must also be factored into students’ choices. At least two of the courses must be writing intensive (Written Communication). (Students must demonstrate competency in writing or complete one composition class before attempting Written Communication courses that are in Areas of Knowledge.) At least three of the courses must have Critical Thinking as a major learning outcome. Students must also sample at least two courses with a focus on Scientific Literacy and two courses with a focus on Quantitative Literacy. Students must take at least one course with a primary focus in Critical Reading, one in Oral Communication and one in Information Literacy. Additionally, students are encouraged to explore courses designed to broaden their perspectives on various Curricular Themes including globalization, diversity, civic engagement, sustainability, moral and ethical reasoning, and healthy living. Students are required to take a minimum of two courses from amongst these areas before they graduate. All freshmen are required to complete a Liberal Learning Seminar sometime during their first year. General Education courses must be at least 3 credit hours and address at least one of the university’s seven general learning outcomes. 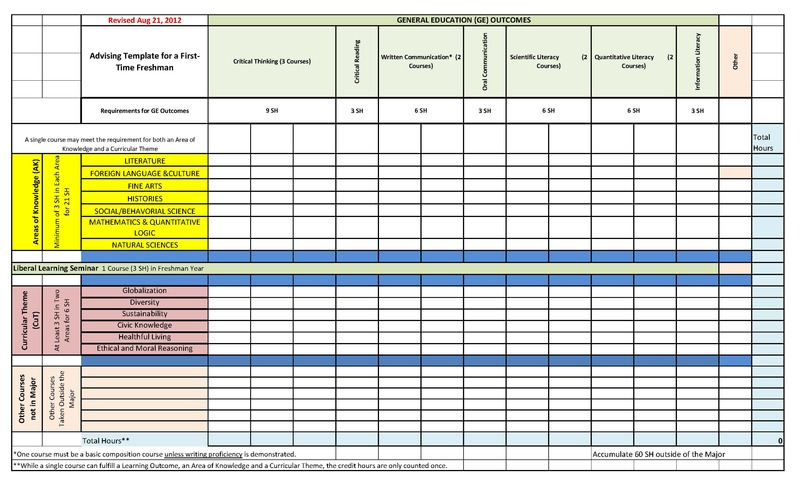 Laboratory or practicum courses of less than 3 semester hours should be tied to a general education course in order to be counted in the 60 hours of general education credits. New general education courses will be approved by Academic Standards and Curriculum using a standard set of criteria. Courses in the general education inventory can meet multiple outcomes. For instance, a single course, if so designed, can address critical thinking, natural science, and sustainability. Academic majors cannot prescribe general education hours other than to state the pre-requisites courses for the major courses. Pre-requisite courses for major courses (generally at the 1000 and 2000 level) that have been approved as general education courses can be used to meet general education requirements. Approved general education courses do not need to be counted in the 60 hours of major credits even if the course ID is the same. For example, BIO 2301 is the suggested general education course that biology majors should take. It is in the general education inventory and thus available to all students and can be counted as a general education course for biology majors and not a required biology major course. Literature: Courses designed to engage students in the careful reading and critical analysis of imaginative literature. Through the close reading of selected texts, these courses seek to deepen students understanding of the ways writers use language to provide both meaning and pleasure for their readers. Historical Studies: Courses that provide insight into the development of human institutions, their similarities and differences, and the means by which knowledge about the past is acquired. Social/Behavioral Sciences: Courses that increase students’ knowledge of how social and behavioral scientists discover, describe, and explain the behaviors and interactions among individuals, groups, institutions, events and ideas. Natural Sciences: Courses that deal with matter, energy, and their interrelations and transformations or with objectively measurable phenomena. Mathematics and Quantitative Logic: Courses that focus on patterns and relationships using carefully defined terms and symbols with an emphasis on clarity and argument. The Fine Arts: Courses that highlight the ways in which art is a major defining aspect of culture, as well as on how art reflects the lands and times in which we live. Foreign Language and Culture: Courses that emphasize development of proficiency in speaking, listening, reading, writing, and culture, as well as content-specific courses in which students continue to expand and refine their linguistic and cultural competence. Critical Thinking (3 courses)–analyze, synthesize or deconstruct, interpret and evaluate information and concepts across or within a discipline to solve problems. Critical Reading (1 course)–extract, decode, evaluate, interpret, and construct meaning through interaction with written language. Written Communication (2 courses) –use appropriate language, conventions, organization, supporting evidence, and content to effectively communicate in writing for the purpose and audience. Oral Communication (1 course)–use appropriate language, conventions, elocution, poise, organization, supporting evidence, and content to effectively communicate through the spoken word for the purpose and audience. Scientific Literacy (2 courses)–exhibit knowledge of scientific concepts and processes and ability to engage the scientific method towards informing decision making and participation in civic, social, cultural, and economic affairs. Quantitative Literacy (2 courses)–understand and create arguments that are supported by empirical evidence and clearly communicate those arguments in a variety of formats such as using words, tables, graphs, mathematical equations, as appropriate. Information Literacy (1 course)–identify, locate, evaluate, and use information effectively and responsibly to increase understanding. Effective as of the Spring term 2013, all Written Communication courses will require at least three (3) visits to the Writing Center. All basic science and mathematics courses will require students to utilize a tutor or engage in Supplemental Instruction whenever they score below 70% on two consecutive quizzes or exams. At all times, there are particular concepts, themes and ideas that raise concern and debate within society. These themes are often particular to the times, but how they are reconciled may have long-term implications for individuals and humankind alike. Creating opportunities for students to grapple with such topics helps to foster attitudes of awareness, interest, attention, concern, and responsibility. 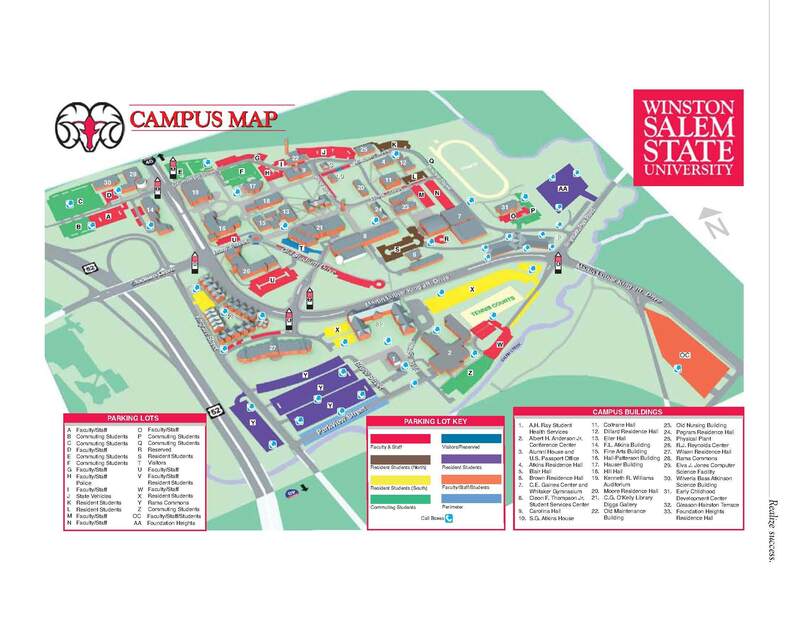 Students at Winston Salem State University are required to take at least one course from at least two of the themes listed below. Globalization: Facilitates understanding the connection between people from diverse cultures; developing awareness of global environmental resources and issues; understanding how their own behavior affects and is affected by larger world patterns; developing insights into alternative worldviews. Diversity: Facilitates understanding of the dynamics of domestic cultural groups and the impact of characteristics such as race, socioeconomic class, gender, sexuality and the like on human interactions. Sustainability: Fosters understanding of how to meet the needs of the present without compromising the ability of future generations to meet their needs. Civic Engagement: Facilitates the development of knowledge, skills and values needed to be effective active citizens. This may include understanding the responsibility to improve community conditions, build healthier communities and address social problems. Moral and Ethical Reasoning: Focuses on the intellectual tools and understandings necessary for reasoning through ethical issues and problems in an insightful manner. Healthy Living: Facilitates the knowledge and behaviors to make informed decisions about and to live a healthy life. Liberal Learning Seminars (LLS) are designed to bring small groups of students together with faculty or staff on a regular basis. These seminars place a strong emphasis on critical inquiry, reading, frequent writing, collaborative learning, and other skills that develop students’ intellectual and practical competencies. LLS bring students and faculty together in a shared process of inquiry around a broad, sometimes interdisciplinary topic or question. Freshmen and transfer students with less than 30 hrs. are required to take an LLS in their first year.